so greatly performed that you live the story ! I m happy to have discovered this book, i found it great, but it's not the kind of book you read a few times ! Avec quel autre livre pouvez-vous comparer Thérèse Raquin ? Expliquez pourquoi. Qu'est-ce qu'a pu apporter Kate Winslet de plus à l'histoire par rapport à si vous aviez lu le livre ? great performance, Kate Winset gives life to the book, and you fell like you're into it ! "Be careful what you wish for" would make a better title for this book. I was wondering why Kate Winslet chose this book, published in 1865, to narrate. I now understand that the movie version is due out in 2013. Kate Winslet was attached for a long time to star in the lead role. Then Eva Green replaced her with Gerard Butler as Laurent. In the fall of 2011, Elisabeth Olsen was announced as a replacement in the lead role with Glenn Close as Madame Raquin and Tom Felton. This book has been adapted on film many times and in several languages, going as far back as a silent film adaptation in 1915. That must have been interesting. I'm really looking forward to Glenn Close's eyes burning into Thérèse after Madame Raquin becomes mute and learns the truth. The French author, Emile Zola, intended to study temperaments and not characters. His main characters were assigned various humors according to Galen's Four Temperaments: Thérèse is melancholic, Laurent is sanguine, and Camille is phlegmatic. The characters are often given animalistic tendencies, every one of them almost entirely consumed by self-interest. Thérèse and Laurent are often rightly described as brutes. I don't generally finish a book in which I don't actually like ANY of the characters. After all, why should I spend time with them if I don't like them? But Kate Winslet's excellent narration kept holding my attention until I began to understand and better appreciate the story. I'm glad I listened to it, and I can now see its significance and influence on other later works of literature. Stick with it to the end and you'll appreciate the overall story and the style of writing as well. It must have been amazing when they performed this on stage in an opera, which lends itself so well to the drama. An interesting story on many levels. What did you love best about Thérèse Raquin? I loved the way Zola delves deeply into the psychology of his characters and not just the two main characters, but others as well. It is dark, brooding and cynical, but not overbearingly so. I found I enjoyed it as a horror story and as a commentary on French society of the nineteenth century--it works wonderfully as one or the other or both! To be honest I bought the book for her narration--I was not disappointed! Her voice and inflection are incredible and very easy to follow. She reads with emotion but not obnoxiously--her narration is subtle and she is also wonderful with the French names and places in the story. It was disturbing and dark--but in a good way. It makes you think about the way human minds work with the added benefit of seeing how the nineteenth century's view of moral choices is portrayed in the book and how that plays out in the plot. As another reviewer said, the narration of Kate Winslet was wonderful and I enjoyed listening to her, I just wish I had enjoyed the story more. I understand it is a study in jealousy and in how people handle guilt and remorse, but the writing style just failed to keep me interested. The idea behind this reminded me very much of Poe's Tell-Tale Heart. Of course it is a matter of personal preference, but for me I found the story extremely boring and the characters so flawed that I didn't care what happened to any of them. In fact, most every character is so flawed that they become cookie cutter "bad," like the proverbial villian in the black clothing of old movies. As much as I love listeining to Kate Winslet, the story just didn't catch my interest. Kate Winslet is a gifted actress and she can add talented narrator/story teller to her list of accomplishments. She is reason alone to partake of this audiobook. Zola is a solid writer who delves deeply into flawed characters' motivations and obsessions. However, the writing is not even close to Henry James or D. H. Lawrence as I was hoping for at the start of the book. Definitely worth a listen, just don't expect a classic masterpiece. The actress Kate Winslet did a fantastic job with the narration though. Maybe I just don't enjoy listening to a couple's reptitive and obsessive fretting . Neither character was sympathetic enough for me to care. I do enjoy character intense novels, but this couple never developed any nuanced anything! 30 sur 35 personne(s) ont trouvé cet avis utile. Kate Winslet delivers an outstanding reading of Thérèse Raquin. However, the story is so dark, repetitive, and long that it eventually becomes tiring. I enjoyed it at first, but the final chapters were painful. You know how this sad tale will end and by those last chapters, you just wish it would! 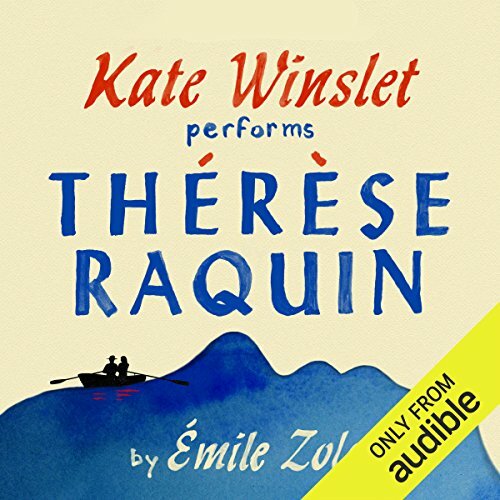 Would you consider the audio edition of Thérèse Raquin to be better than the print version? I was very intrigued by this first of Zola's novels, having read Nana in a college class on belle epoque European cities (including Paris). This one was much more narrow in scope, with the focus on the murderous/traitorous couple that bring about the death of Therese's husband. I thought the first half was much more interesting and better paced than the last half, which seemed to just drag on too long (though I understand the beauty of Zola's dissection of the couple's lives post-murder). Definitely worth listening with Kate Winslet narrating (5 stars for that part :)). Her voice is so wonderful, and I thought she did pretty well with the different male and female characters. I would listen again just to hear her speak for 8 hours :). The story isn't quite my type of book, but I ended up finding it more engaging than I expected. But, I love Kate Winslet and would be happy to listen to anything she wants to read for as long as she will continue reading! She is an amazing actress so it's no surprise that she is also an excellent narrator. The story was really gripping from beginning to end. Full of tragedy, lust and human emotion. Kate does an amazing job of narrating. I will be recommending this to my friends and family. Outstanding! I would absolutely listen to Therese Raquin again.